When boat sales rebounded in May, some industry observers hoped it was a sign of a late-blooming spring selling season that would extend into early summer. From that perspective, the mixed June results that Statistical Surveys reported were disappointing. Sales in the main powerboat segments rose a modest 1.8 percent, or 173 boats, to 10,047, compared with the same month a year earlier, and industrywide sales fell 2.7 percent, or 475 boats, to 17,147, in 24 early-reporting states that represent 54 percent of the national market. Damp and chilly early spring weather was widely believed to have played a major role in slow sales from February through April. 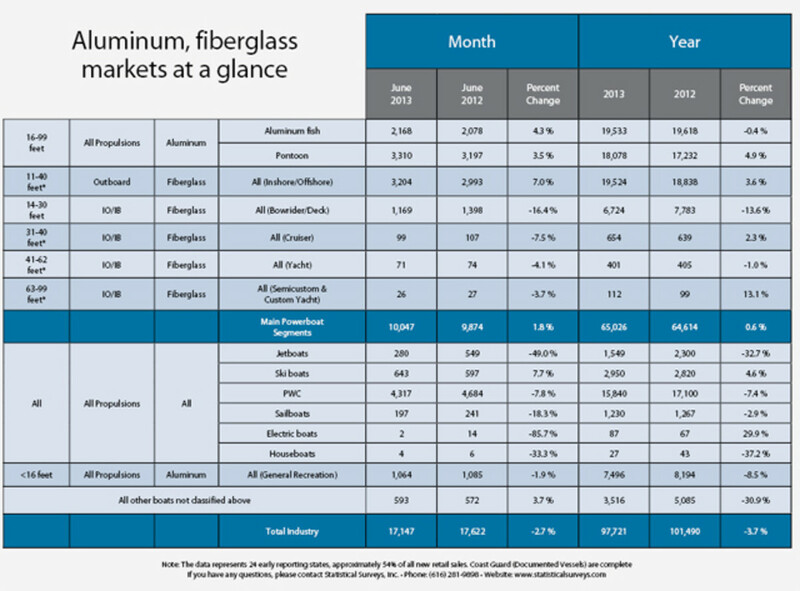 Gains in May that included a 7.1 percent increase in the main segments ended three months of declines and appeared to give the industry some much-needed momentum. The June data suggest that the surge was short-lived. For the year through June in the early-reporting states, sales in the main segments were virtually flat — up 0.6 percent, or 412 boats, at 65,026 — and sales across the industry were 3.7 percent lower, or 3,769 boats, at 97,721. Kloppe said he thought at the start of 2013 that industrywide sales would grow at a rate of 3 to 5 percent this year. Consumers who planned to buy a boat but delayed their purchase because of poor spring weather are deciding whether to go forward now. He said pontoons and ski boats traditionally sell well during the summer. Among the main segments, only aluminum fishing boats and pontoons and 11- to 40-foot outboard fiberglass boats showed sales gains in June. Fishing-boat sales rose 4.3 percent, or 90 boats, to 2,168, and pontoon sales gained 3.5 percent, or 113 boats, to 3,310. Sales in the outboard fiberglass group climbed 7 percent, or 211 boats, to 3,204. The only other category in the Statistical Surveys report that showed a sales gain in June was ski boats. Sales in that segment rose 7.7 percent, or 46 boats, to 643. Sales of 31- to 40-foot cruisers fell by eight boats, sales of 41- to 62-foot yachts declined by three, and there was one less yacht sold in the 63- to 99-foot custom and semicustom category. The Coast Guard was up to date in June on its reports of documented vessels, so the sales figures for boats larger than 31 feet were complete. Sales of jetboats fell 49 percent, or 269 boats, to 280, and personal watercraft sales dipped 7.8 percent, or 367 units, to 4,317. Kloppe said Sea-Doo’s departure from the jetboat market has hurt sales in that category, and he believes it will rebound once the builders that are moving in get their boats ready.